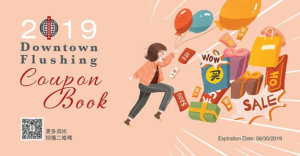 The Flushing BID is officially releasing the 2019 coupon book offering exclusive discounts at businesses located in Downtown Flushing. Over 60 participating businesses will be offering their discounts through this year’s coupon book, from restaurants to retailers, beauty services to professional services. 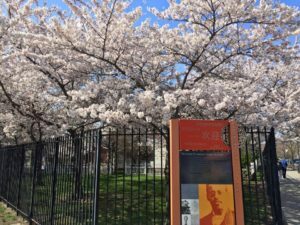 Enjoy one of the best cherry blossoms in NYC at the home of African American inventor and humanist, Lewis Howard Latimer! The garden of cherry trees at Lewis Latimer House Museum will be open to the public for free during regular museum hours: 12pm-5pm on Wednesday, Friday, and Sunday. 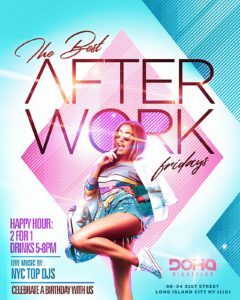 FREE ADMISSION: Ladies all night & gents free until 12 am On Guest List. Sign up for the Guest List today. Please Note Doha Nightclub NYC Rules & Dress code. All guests must be 21 & over with Proper ID required. 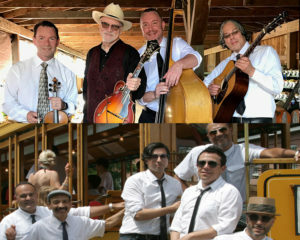 Spring is in the air and Quiet Events is back at Bohemian Beer Garden! Join us as the weather gets warmer and the parties get hotter. Our 3 live DJs always bring the best vibes and even better jams. This event will be outside if the weather’s on our side! With your pair of Quiet Events headphones you can adjust the volume and choose between our three DJ’s with the flick of a switch. Each headset has a color LED that shows which channel you’re listening to. 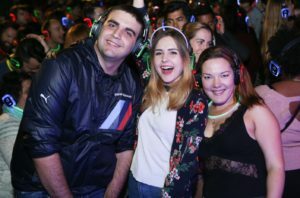 You can dance along with those tuning into the same DJ as you; it’s super social. There’s no loud music to talk over and there’s no ringing in your ears when you leave! 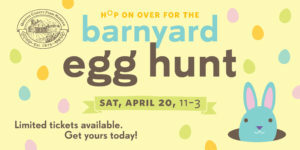 Bring your baskets to the most celebrated egg hunt in Queens! Egg hunts are ongoing throughout the day. Meet Whiskers the Bunny and try your luck at egg tossing and egg rolling games. Visit our farm animals and take a hayride! Food vendors will be on the farm all day selling their treats! 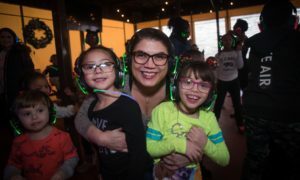 Make this your kid’s birthday party or just a fun afternoon with your friends while your kids are entertained by our interactive DJs getting them to sing, dance, and have a great time. We’ll also have a small arts & crafts table with coloring books, markers, crayons, and other fun activities for the kids to do if they don’t want to join the headphone party. Click on the event page for more details. We’re mashing up 2 cultures on 1 stage with an open dance floor! Starting with dance lessons, each band plays a set, then the two meet and jam. Get ready to square dance with mandolin, bluegrass master Buddy Merriam and Back Roads, mashing up the night with the hip-swiveling, Afro-Cuban rhythms of Conjunto Guantánamo. The dance floor will sizzle! 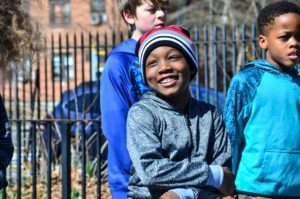 This April, City Parks Foundation is kicking off its 2019 Spring sports programs for young people living in Queens, Brooklyn, Bronx, or Manhattan. CityParks Track & Field, presented in partnership with New York Road Runners and supported by the Randall’s Island Park Alliance, gives New York City kids, ages eight to 14, the chance to learn the basics of the sport. From hurdles and relay races, to long jump, shot put and javelin throw, this program runs from April 20 through June 8 in Brooklyn, the Bronx, and Queens, with sessions once per week. The Jesse Owens Track and Field program introduces novice runners to cross country distance running through runs from East Harlem to Randall’s Island Park. This program runs from April 7 – June 23 in Manhattan, and is held once per week. Online registration is now open for all spring programs at CityParksFoundation.org/play. Participants are encouraged to register online in advance, though walk-up participants may register on-site if space permits. For more information and a full list of City Parks Foundation’s 2019 sports programs, please visit www.CityParksFoundation.org. Please contact sports@cityparksfoundation.org or call (718) 760-6999 for any questions. Myrtle Ave. & Woodhaven Blvd. Neptune Ave. & Bayview Ave.
Lafayette Ave. & Morrison Ave.
E. 112th St. & 1st Ave.